Summit Racing now carries the Nitrous Express Hot Water Bottle Bath. It allows racers to bring their nitrous oxide bottles up to the proper temperature before the bottles are moved into the car, ensuring proper bottle pressure for reliable and repeatable nitrous oxide system performance. The Hot Water Bottle Bath can be bolted onto a trailer floor or truck bed, or carried trackside. When i'ts time to race, simply pull the bottle out and install it in the vehicle. The high strength composite tank features integrated carrying handles for easy transport and includes mounting tabs for permanent installation on a flat surface. Unlike metal tanks, the Hot Water Bottle Bath’s composite tank will never rust or corrode. It also insulates better, which means the bath heats up quicker and maintains temperature longer so the heating element doesn’t have to activate as often. Nitrous Express added a handy control panel and digital readout at the top of the Hot Water Bottle Bath. This makes it easy to adjust the temperature and take quick temperature readings. The digital control circuit has a straightforward set up procedure and delivers temperature accuracy to within one degree. Multiple drain plugs and a slim profile allow the bath to be mounted in a variety of locations. 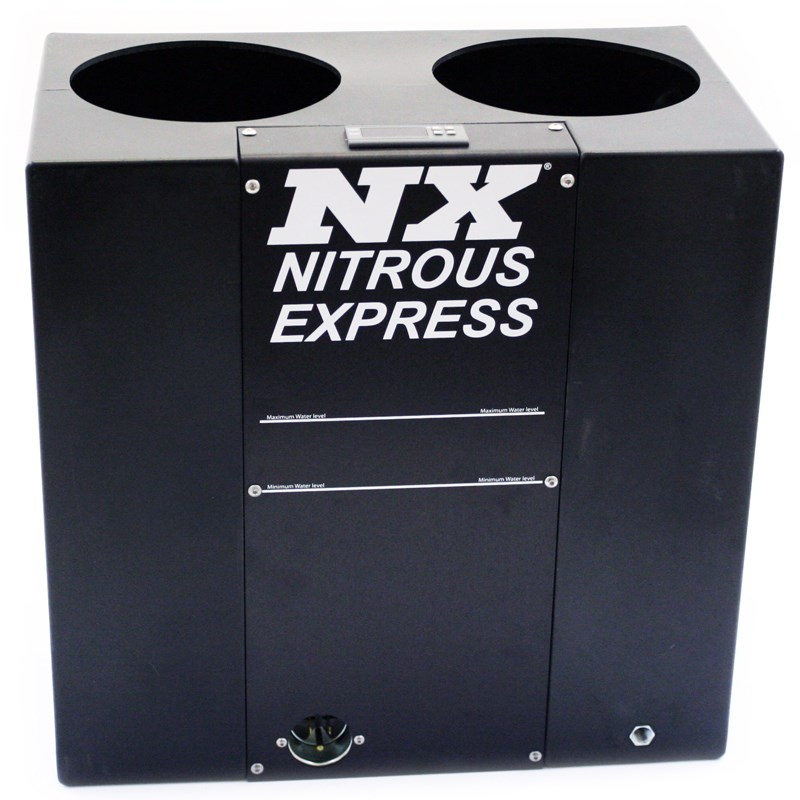 The Nitrous Express Hot Water Bottle Bath is compatible with 10, 12, and 15 pound nitrous oxide bottles.